Introduction: Hi my name is Audax from Audax Artifex (yes this web site). Whenever I visit my sister and her family in S.E. Queensland Australia she always welcomes me with a fresh batch of my favourite baked treat which we devour gleefully with cups of tea while we chat and catch up with the events in our lives. 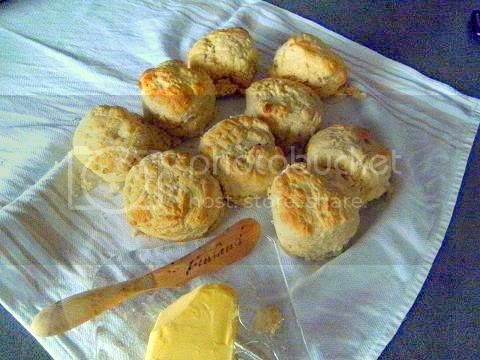 The treat that I'm talking about is the basic scone (also know as baking powder biscuits in North America) my sister really knows how to make them, they are wondrously light with soft sides and a lovely airy crumb – superb with jam and cream. 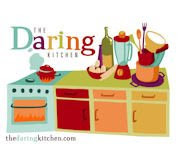 This month I want the Daring Bakers' to share my delight and I invite you to bake a batch of scones to enjoy with friends and family. For our North American members I wish to clarify what this challenge is all about and try to avoid any confusions. Scones in North American are nearly always triangular in shape have a slightly crisp crust usually covered in sugar and have a soft interior crumb and sometimes are laced with dried fruit (these baked goods in Australia and England are called “rock cakes” since they are usually made to look like “rocky” cakes not wedges), meanwhile biscuits in North American are a round shaped buttery slightly flaky baked good usually eaten with meals (these items in Australia and England are called “scones” and are eaten with butter and jam usually with cups of tea or coffee as a sweet snack). 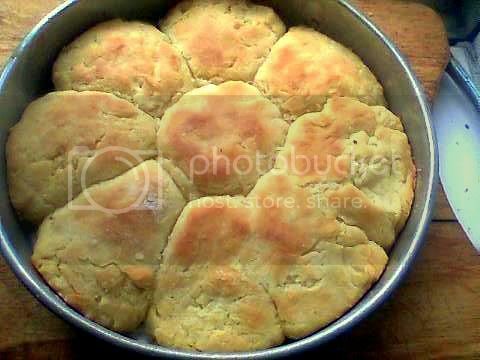 So this challenge (using the North American name) is to make biscuits. 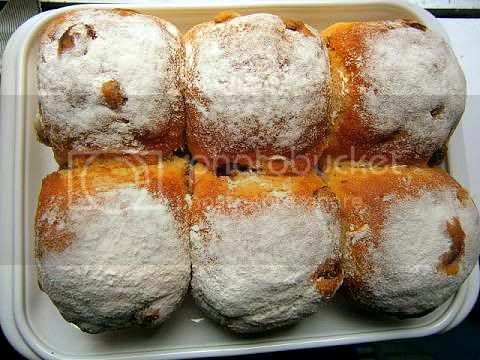 Or using the Australian or English name this challenge is to make scones. To further clarify for our North American bakers this month's challenge is to make biscuits (also called baking powder biscuits) if you choose to make your biscuits using buttermilk as the liquid you are making what are known as “Southern” Biscuits which are one of the most famous examples of home cooking in the Southern States of America (that is they are a baking powder biscuit made with buttermilk). 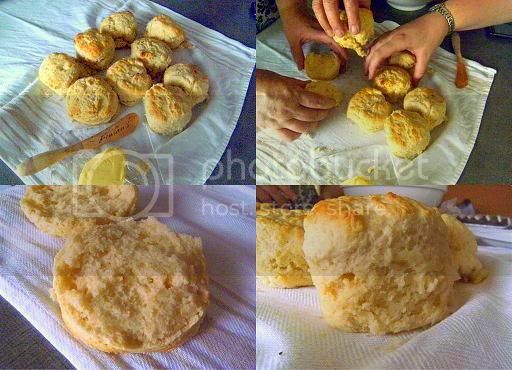 In Australia and England “Southern” Biscuits would be called buttermilk scones. 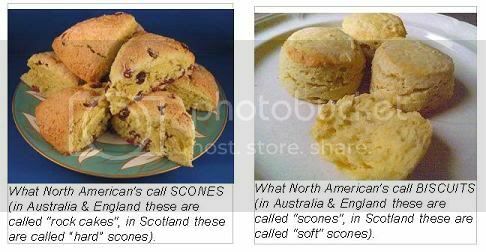 So restating the above, the challenge is to make scones (using the Australian/English name) or to make biscuits (using the North American name). Incidentally if you use cream as your liquid in the challenge recipe the final baked good would be called a cream biscuit in North America or a cream scone in Australia and England. 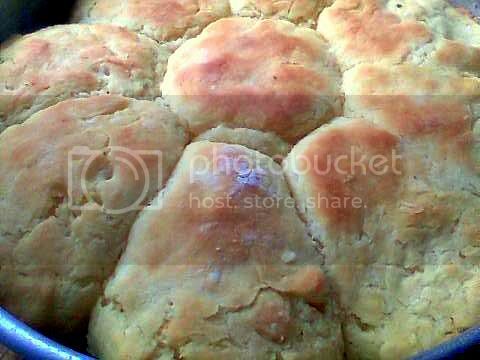 Scones (biscuits) contain only a small number of ingredients they are fast to make, quick to bake, only cost cents per batch and most importantly are super FUN to eat. In England and Australia scones are eaten with jam and butter usually with cups of tea or coffee mostly as a sweet snack, while in North America they are usually eaten with meals as a savoury side. So after studying many many (288 websites bookmarked) scone/biscuit recipes and the bakers' comments about these recipes and after doing 16 batches! myself I have acquired a lot of information to help you master the techniques involved I hope that at the end of this challenge that you will be able to make a good if not great scone (biscuit). After much research and many attempts … finally some scones (the 14th, 15th and 16th batches) that I wouldn't mind sharing with my sister. As I mentioned in the challenge posting in Australia and England scones are usually eaten as a sweet treat (with butter and jam) with cups of tea on that theme while doing my research for this challenge I thought I would do a variation on the sweet side of the scone. Here is one recipe that is suitable for kids and adults when you want something special and sweet yet can be made at a moment's notice. 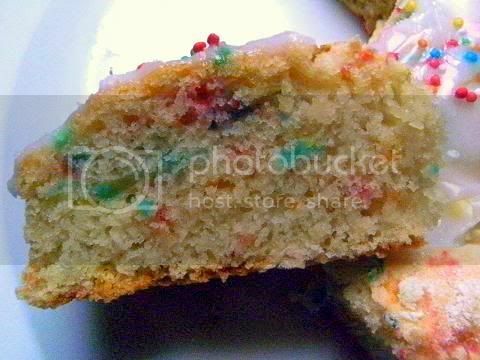 In Australia one of the most popular children's party food item is fairy bread. 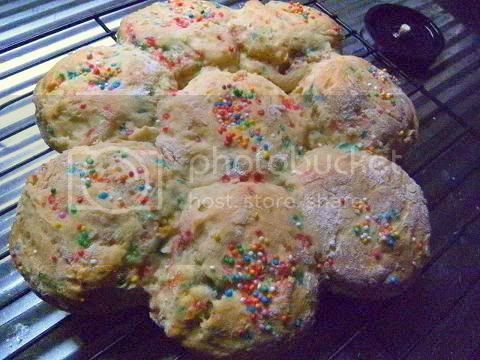 This is a variation of fairy bread called Fairy Ring made with an Aussie Scone (Damper) ring laced with 100s and 1000s then iced (with some icing sugar and a touch of lemon juice made into a sticky paste) then sprinkled with more 100s and 1000s (coloured sprinkles). My 9 year old niece went crazy with delight and literally squealed with glee when I showed her this Fairy Ring and say I made it especially for her. 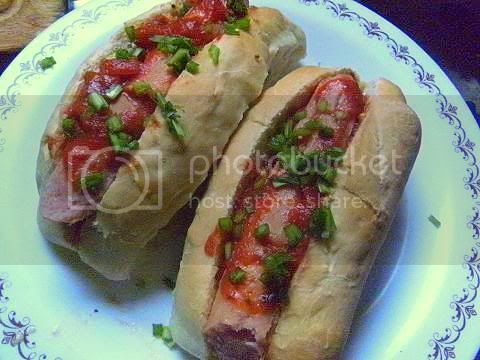 Here is a savoury variation, I made hot dog buns using the basic scone recipe. They worked out great I couldn't believe the crumb and they tasted great with the hot dog and relishes and I made them in under 15 minutes (once the oven was hot enough). 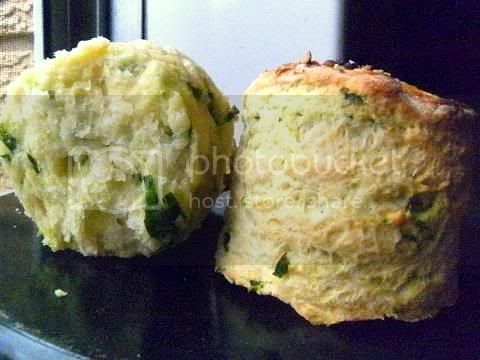 I was very surprised how well the basic scone dough complimented savoury food. Here is the answer to dry biscuits this recipe is called "touch of grace" biscuits which uses a few simple techniques to create a super moist crumb. 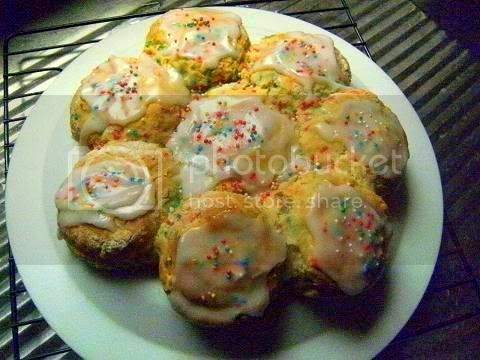 These scones are all about tenderness everything is designed to obtain the softest and most tender crumb possible. These are very different from the normal bread-like scones that Australians like with jam and cream. These would be perfect with a savoury meal. They were so buttery with a soft creamy crumb that literally melts in your mouth, the mouth feel is like clouds. As one reviewer lovingly opined "They're squat little puffs you'll want to grab, steaming, from a basket passed over fried chicken or bacon and eggs". The way I make them is slightly adapted from the original recipe, I use a lot of very large pieces of butter and all buttermilk with very low gluten cake flour and some resting time in the fridge. Resting the dough after the buttermilk is stirred into the dry ingredients is essential you would never be able to form the soft balls of dough coated in flour that are the "rounds" in this case and keeping everything cold helps the baking process. 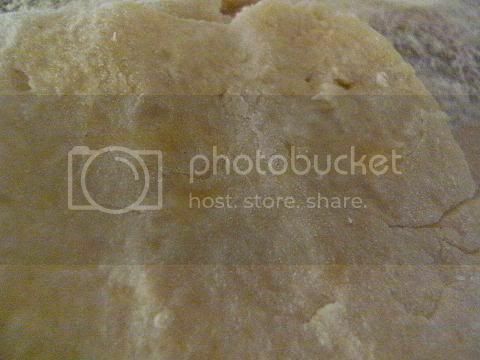 While baking the large pieces of butter melt into the flour causing large air holes to form in the baked dough and since we use soft flour (6%) which cannot form flaky layers we thus obtain a feather-light creamy tender crumb infused with the maximum amount of butter that the dough can hold. These scones are made entirely from cake flour (6% gluten), I used 1 cup of flour, 2 teaspoons baking powder, 1/2 teaspoon baking soda, 1/4 cup very large-sized butter pieces, about 1/2 cup buttermilk and 1/2 teaspoon sea salt. I rubbed in butter making sure most of the fat/flour where large pea sized pieces. I rested the dough after I mixed in the wet ingredients for 10 minutes until cold, during this time the dough "firms" up making it possible to turn it out in one cohesive dough ball onto a lightly floured board. 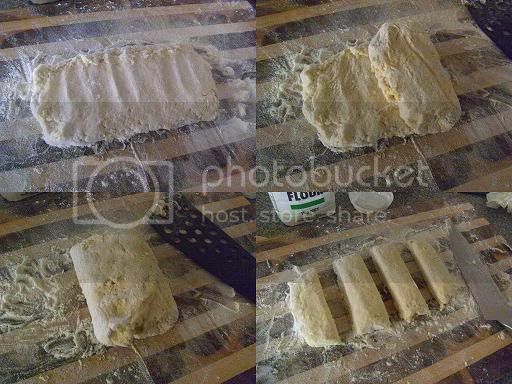 I formed a rectangle of the soft dough floured the top lightly then I stamped out rounds. You could feel the pieces of butter in the formed round The rounds are very soft but can be picked up and placed into the baking dish. Then I place the baking dish with all the formed rounds back in the fridge for 10 minutes until cold then bake. (This procedure is much easier than the original recipe's method and it gives as good results I think). 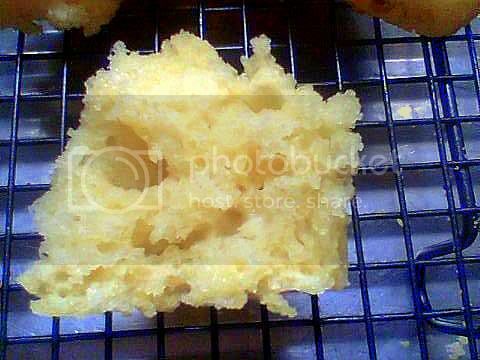 As you can see the crumb is saturated with butter and has masses of large airy pockets to trap your favourite topping. Absolutely delicious. 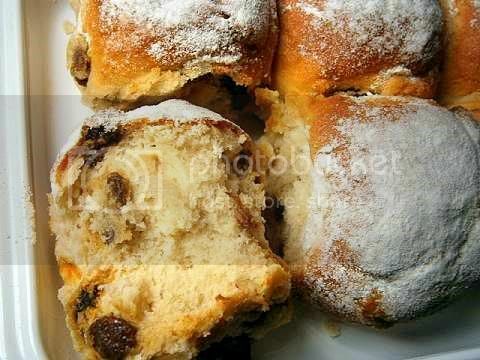 I wanted to make one batch of flavoured scones I went with sweet raisins and some molasses in the dough. 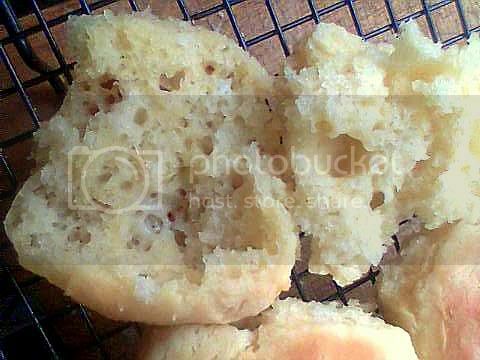 I rubbed in the butter until it was like fine sand and I used "OO" cake flour about 7% protein and some cornflour (cornstarch), I was very happy with the look of the baked scones and the crumb was very tender very much like bread which is what I wanted. These were very cute looking but to be honest I like plain scones much better. 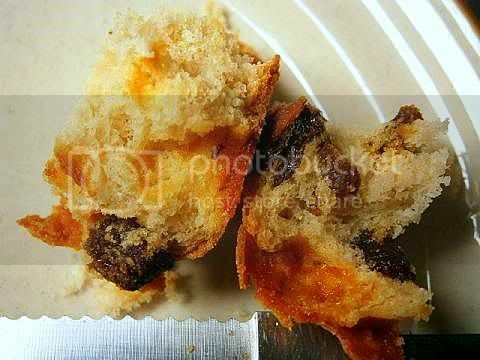 The bread like crumb of the scone so so tasty and soft. 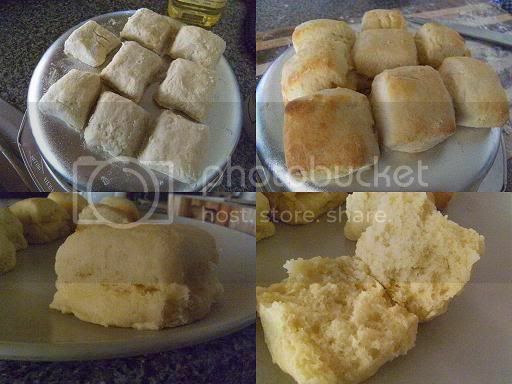 As you can see scones (biscuits) are all about technique since the scones pictured above used the same basic recipe. Flour – lower gluten (i.e. soft) flours (about 9% or less protein) produce taller and lighter scones than normal plain (all-purpose) flour (about 10%+ protein). But to be honest it wasn't that great a difference so long you sifted the dry ingredients thoroughly at least three times. That is always triple sift the dry ingredients this will ensure that the flour is well aerated and the raising agents are evenly distributed so resulting in light scones. 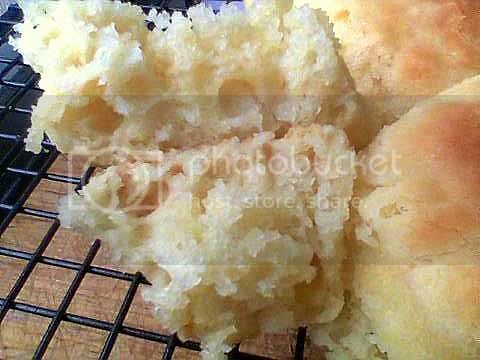 I found that finely milled soft “OO” flour gave the best results but don't worry you can get excellent results with sifted plain (all-purpose) flour. 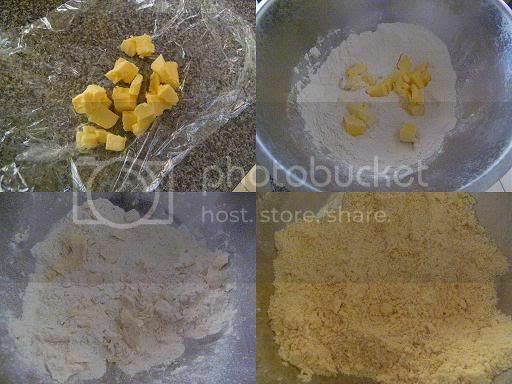 You can use self-raising flour if you wish (remember to leave out the raising agents and salt) in the recipe below it is important to triple sift the self-raising flour as well I like to add about ½ teaspoon of extra fresh baking powder per cup of self-raising flour to ensure a good lift in my scones. In the northern states of America and most of Canada all-purpose flour is generally very hard (high in protein) you can replace for each cup 4 tablespoons of all-purpose flour with cake flour OR for each cup replace 2 tablespoons of all-purpose flour with cornflour (cornstarch). Or you can let the scones rest (20 mins) in the fridge before baking. Chemical raising agents – always use fresh raising agents, baking powder deteriorates within two months once the jar is opened, typical usage 1 to 2 teaspoons per cup. Baking powder nowadays is double action – there is an initial release of gas once the dry and wet ingredients are combined and there is another release of gas from the high heat of the oven. If you are using acidic ingredients (such as buttermilk, soured milk, honey, citrus juice, yoghurt, tomato sauce etc) then use an additional ¼ teaspoon of baking soda per cup of liquid to help neutralise the acid and make the final baked product raise correctly. Baking soda is much stronger (x4) in raising power than baking powder. You can make you own single action baking powder by triple sifting together one part baking soda and two parts cream of tartar store in an airtight container. To check if your double action baking powder is fresh place 1/4 teaspoon in 1/2 cup of water it should bubble a lot, then microwave it for 30 secs it should bubble it again. To check your baking soda place 1/8 teaspoon into 1 tablespoon of vinegar (or lemon juice) it should bubble a lot. Liquid – you can use milk (any sort), buttermilk, soured milk, yoghurt, half-and-half, cream, coconut cream, soda water, even lemon-flavoured soda pop (soft drink) or a combination of these as the liquid in your scones. You can sour regular milk with a tablespoon of cider vinegar or lemon juice for every cup. Just stir it in and let it sit for 10 minutes or so to curdle. Typical usage is 1/3 to 1/2 cup of liquid per cup of flour. Moistening and bringing the dough together - add nearly all of the liquid at once to the rubbed-in dry ingredients. When mixing the dough (I use a soft plastic spatula, my sister uses a knife), stir with some vigour from the bottom to the top and mix just until the dough is well-moistened and begins to just come together it will be wet (and sticky). And remember the old saying – the wetter the dough the lighter the scones (biscuits)! 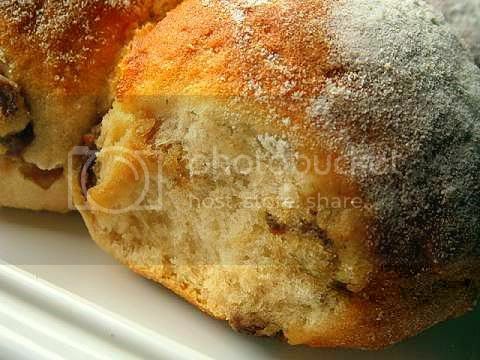 Baking your scones – always preheat your oven when baking scones. Place each scone almost touching onto the baking dish this encourages the scones to raise and also keeps the sides soft and moist. If you want crisp sides widely space your scones on the baking dish. Don’t over-bake your scones. Over-baking for even a minute or two will dry your scones out. As soon as the sides begin to turn brown and are set, remove them from the oven. Immediately, place the scones on a wire rack—the hot pan will continue to dry the scones. 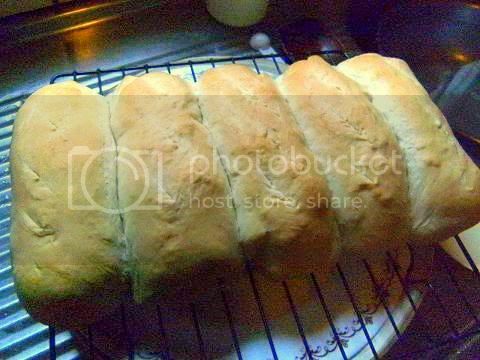 Extra comments about resting the dough – I found in my researches that a number of respected sources mentioned resting the dough in various stages in the recipe. Surprisingly this advice is sound. I found that if you rested the just mixed dough (in the fridge) for 20 minutes there was a huge improvement in the dough's handling qualities and the final scones height, lightness and crumb were outstanding. Also I found that if you rest your patted out dough covered in plastic for 10 minutes in the fridge that the rounds are easier to stamp out and the final baked goods raise higher and have a better crumb. Also you can rest your stamped out rounds in the fridge for a couple of hours without harm so you can make your scones place them into the fridge and then at your leisure bake them later great for dinner parties etc. This is possible because modern baking powder is double action, i.e. there is another release of gas when you bake the rounds in the heat of the oven. 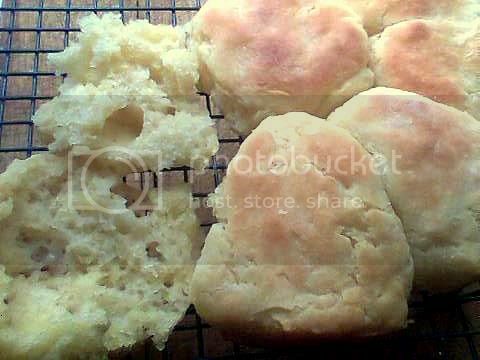 The biggest problem that scone/biscuits can sometimes have is an after-taste (sometimes described as metallic or a salty chemical taste) or the mouthfeel is dry and chalky (i.e. 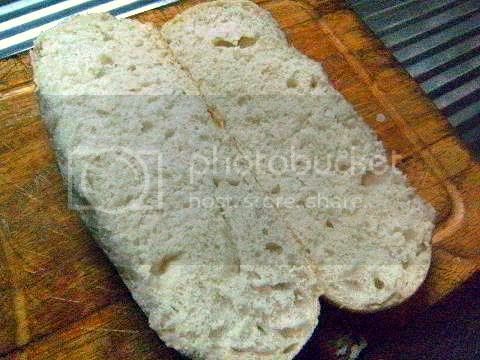 the crumb is tough and doesn't have enough moisture). look for a double action baking powder that uses non-metallic ingredients in it, check the ingredients listing on the packet. if you used an acidic liquid (buttermilk etc) and did not use some baking soda with the normal baking powder then some of the acid in the liquid wouldn't have been neutralised so leaving some salts behind causing the salty aftertase, that is make sure you are using the correct combination of agents for the liquids that you use, see the link below for full details about this. use bakers' ammonium (available from King Arthur's flour) it was one of the most common chemical raising agents in the old days before modern baking powder, it smells like ammonia when baking but the ammonia smell totally dissipates and this chemical leaves nothing behind. I use it a lot in my baking it really gives baked goods that old-fashioned taste that people really can pick up on also it gives cookies extra crispness when baked. See here for a comprehensive posting on baking powder/baking soda and how to use them in recipes. try using more fat about 1/4 cup+ per cup of flour - more fat gives moister crumb. Also try using all shortening, since shortening contains no water or milk solids it gives a very tender crumb. 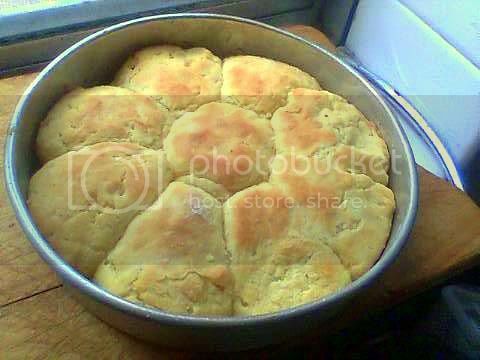 use this great recipe they are called "a touch of grace" biscuits they are the most tender and moist biscuits (scones) that I have had. 1. Clean and flour the scone cutter (by rubbing off any wet dough and then dipping the cutter into fresh flour the entire height of the cutter) every time you stamp out each round. Remember not to twist when you are stamping out the scones. If you are using a knife remember to clean and flour it for each cut. 2. Try to pat out or roll out the dough as evenly as possible. 3. Did you sift the dry ingredients three times? (uneven distribution of ingredients can lead to uneven scones). 4. 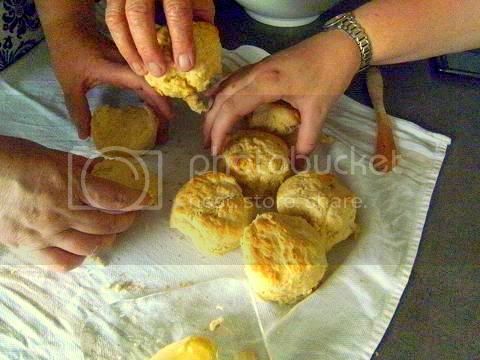 Try to get the scone out of the cutter by applying gentle even pressure on the entire scone circumference that way you do not compress just one place so making that area less tender so raising less when cooked. 5. Turn the cut scone upside down onto the baking dish, since this side will be flatter than the patted out top surface. 6. Only glaze the tops of the scone, a small amount of liquid on the sides will inhibit raise in that area. 7. Some people like to use a fork and prick some holes in the top of the unbaked scones supposedly this helps the scone raise evenly. 8. Also some people like to use their thumb and press a small hollow into the top of the scone supposedly this helps the scone raise evenly. 9. A good article about "making the perfect scone" see here it goes through a lot of the best scone recipes by master bakers. 1. Place a 1/4 teaspoon of baking soda into a tablespoon of vinegar it should bubble a lot. 1. Place a teaspoon of baking powder into a cup, add 1/4 cup room temperature water it should bubble a lot. 2. Wait 30 secs and then place your cup into the microwave heat for about 30 secs until about 180F it should bubble again. 3. If it doesn't then discard and buy a new jar. How to test your self-raising flour - add one tablespoon of S.R. flour into some hot water it should bubble a bit. Or try adding some vinegar and see if it bubbles. Usually SR flour is only good for about three months. 1. Try and use heavy grade dark metal baking dishes which give the best heat distribution. 2. If your oven heating cycle is unreliable (varies the temperature a lot) lower the temperature to hot 220C (430F), preheat the oven along with a heavy metal baking dish for a good 20 mins then bake the scones on the baking dish which acts as a heat sink helping to bake the scones more evenly. Try to bake smaller sized scones which helps with a constantly varying temperature. 3. If your oven has hot spots which mine does just rotate the dish at about 3/4 of the total baking time. 1. Just melt the margarine and add it to the liquid and proceed as normal (this is the best you can do if the margarine is "bad for cutting-in or just bad for scones" in the first place). Mandatory Items: You must make one batch of basic scones (i.e. basic biscuits using the North American name). The challenge recipe has been designed to be fast, very cheap and easy to follow so allowing for multiple attempts to be made until you can achieve your desired result. I encourage you to make a couple of batches to see how small changes in technique can obtain vastly different final baked products. I estimate all of my 16 experimental batches cost less than $4 and took about four hours, so please do take this opportunity to explore the possibilities of the different techniques and advice that have been presented here in this challenge. 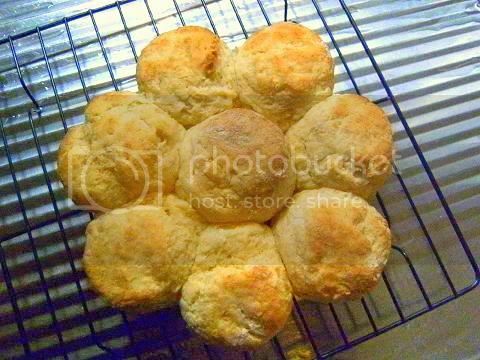 I have included a number of links to the most popular scone (biscuit) recipes (and variations) in a number of countries feel free to use these if you can make a good basic scone (biscuit) already. Variations allowed: A number of variations (cheese and chives, herb, etc) on the basic challenge recipe are included use them if you wish. 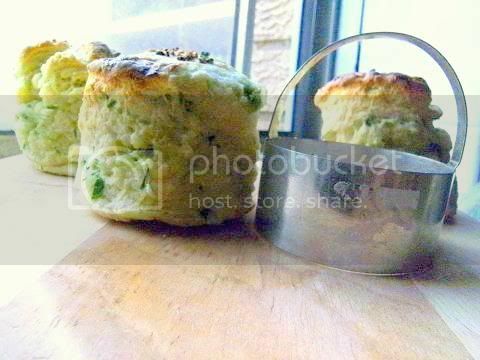 Preparation time: Scones: Preparation time less than 10 minutes. Baking time about 10 minutes. I was at my brother's house and we had a hankering for a baked treat so I decided to make the challenge recipe also I needed some photos of the challenge recipe being made for this posting. My brother isn't a cook, all he had to hand as equipment was concerned was a mixing bowl,a thin walled 20 cm (8 inch) cake tin and a knife, he didn't even have a cup measure only mugs so I improvised. As you can see in the collage below I roughly chopped some butter (I eye-balled about 2 tablespoons) and froze it. Then I throw the frozen cubed butter onto one mug of cold self-raising flour I couldn't sift the flour since my brother doesn't own a sifter. Then I proceeded to rub in the butter with my fingers until I got pea-sized fat pieces coated in flour. I added the liquid (½ mug of cold lite-milk) to the rubbed-in fat/flour mixture until I got a sticky dough I turned this out onto a floured board, I lightly floured the top of the sticky dough then I kneaded it once then I patted it out into a rectangular shape then I proceeded to fold and turn the dough. Notice that you fold 1/3 of the dough over itself then the other 1/3 over that and turn it 90° degrees. Notice the lines on the broad this will help you understand how to do the folding and the turning. 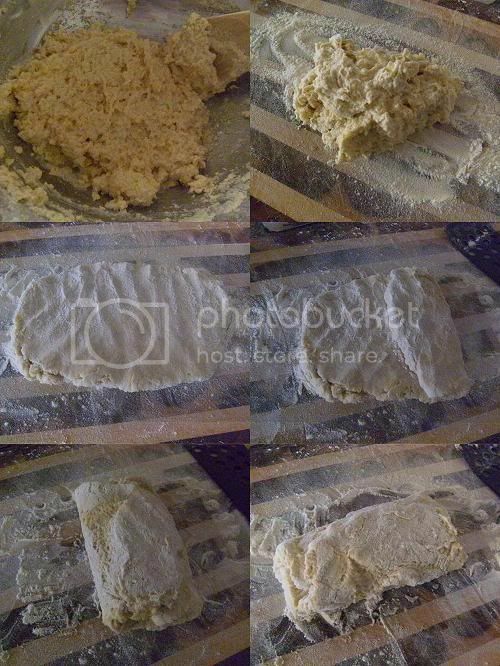 I did a couple more folds and turns and used a well-floured knife to cut out squares of prepared dough. Here is a close-up of the finish patted-out dough notice how you can see the fat particles in the dough this is what causes flakiness in the final baked scone. I used the inverted cake tin as my baking dish and baked the scones in a very hot oven for 10 minutes they worked out really well I thought. Notice the nice central lamination in the scone and the great crumb and how well they rose in height. I placed two unbaked scones in the fridge to test whether resting them for 20 minutes helped improve the raise of the final baked product. 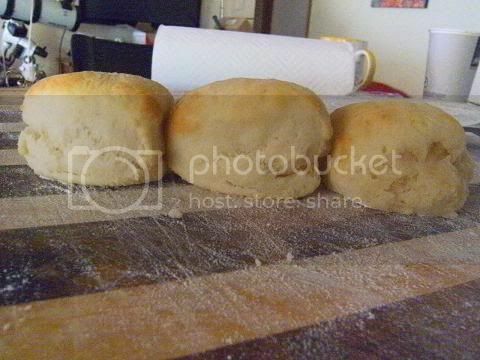 As you can see the left scone and the middle scone are taller than the right scone which was baked immediately after it was cut out from the dough. So don't worry if you cannot bake the scones straight away they do better with a little resting time.